Each day, McNicholas students file through the Café, selecting slices of pizza or boxes of macaroni and cheese, scanning them through the RefreshMe kiosks, and purchasing with a quick place of a finger. However, not every student takes a moment to wonder who took the time to prepare their lunch and stock the marketplace shelves, making sure the kitchen is equipped to fill nearly 600 bellies every day. The answer to this question is the café staff, Taylor Hayes, Sharon Iles, and Donna Spears, and the Milestone wanted to help students get to know them better. Come spring 2018, Hayes will have been working for Derringer Co. at McNick for a year. “This is my home,” she said. At age 24, she has also been married for a little more than a year. She doesn’t have any children, but she does have two cats, a pit bull, and a German Shepherd. In addition, she has a niece. “My niece is my whole world,” she said. Her niece, whose name is Ellie, is “the feistiest little girl I know. Also the cutest, but I’m a little biased,” she said. Hayes enjoys a number of activities, such as rollerblading and creeking, and she loves to be out in the woods. She lived in Florida for two years before moving to the Cincinnati area, and she was in Florida during the Hurricane Irma evacuations. She is also a lover of the arts. “Imagination is as important as education,” she said. She is a fan of cosplay and comic books, especially anything Marvel brand, of which her favorite character is Spiderman. Her art talent resides in painting, another of her favorite hobbies. Iles and Spears said that Hayes’s paintings were some amazing, must-see pieces. Iles has been with Derringer Co. for 15 years, but hasn’t been stationed at McNick the whole time. She originally worked filling vending machines, but eventually accepted the job placement at McNick 2 years ago. Now, she does a little bit of everything in the McNick kitchen, accomplishing whatever needs to be done. As a single woman with no children, Iles enjoys some calm time relishing in her hobbies. “My life’s pretty simple,” she said. She loves being in the outdoors and engaging in outside activities, especially target shooting. She also enjoys spending some time having fun in casinos. Lastly, she loves sports, specifically basketball and football, with her favorite team, The Ohio State University. “I enjoy life. Simple, sweet. I look at it; life is good,” she said. Spears has been with Derringer Co. for five years and is the main cook and kitchen manager at McNick, but she can do nearly everything in the kitchen too. She and her husband have 3 children, as well as 8 grandchildren. Her oldest grandchild, age 23, just joined the Navy, and her youngest is 3 years old. She also has 30 fish, each of which has its own name from the grandchildren. Spears said that she lives her life to enjoy it. “Fun’s the main thing,” she said. She’s an artsy lady with arts and crafts, she loves sewing and woodworking, and she often attends different craft shows around Cincinnati. She has her own side business taking some of her crafts and woodworkings to different art shows and selling them. Two pieces that students can currently see are on display in the Café for the Halloween season. Next to the RefreshMe kiosks and the ice cream freezer is a spooky fall display that includes two sets of witches’ legs, one fashioned to hold a bowl and the other for a plant. Spears made both of these items herself. “Life’s too short. Have fun. Enjoy it,” she said. Café staff Donna Spears, Taylor Hayes, and Sharon Iles work to prepare and serve breakfast and lunch to the McNick community. They are employed by Derringer Co., but have become a part of the McNicholas family. Enter your email address to follow The Milestone and receive notifications of new posts by email. 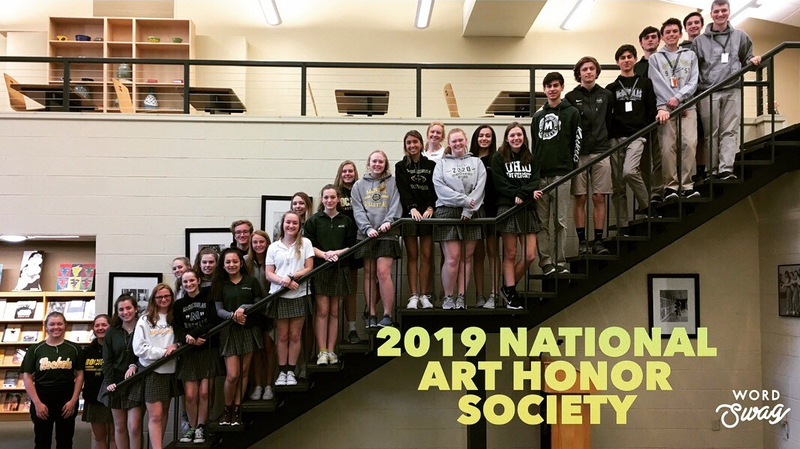 The 2019 McNicholas National Art Honor Society was inducted last Thursday. Students in the art department who plan to major in art or design were chosen to receive a certificate and recognition.